To facilitate the sliding and opening mechanisms in folding door systems, Caldwell supply a variety of functional folding door hardware pieces. Including rollers, top guides and hinges, our hardware is suitable for vents weighing up to 100kg, and measuring 1200mm in width. Our hardware is designed to be discreet, ensuring that it can be installed in sliding doors of any material, as well as coming in a number of variable options to suit all door configurations. 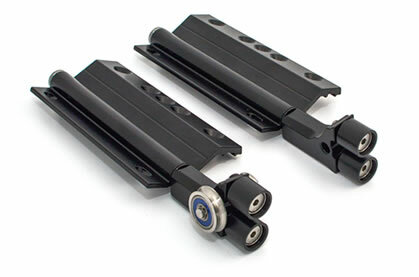 All of our folding slide hardware is designed for durability, and is made to last 25 years with regular use. Supporting vents up to 100kg, our rollers are made with chrome brass wheels with high quality bearings to facilitate a continued smooth sliding operation. Rollers from Caldwell are also supplied with an aluminium hinge bespoke to the door’s profile making for a fit perfectly matched to your door. Additionally, Caldwell are also able to supply single rollers which allows vents to rest adjacent to the door vents or frame. 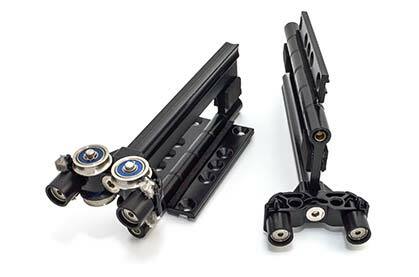 To aid the folding action of sliding door systems, we offer two hinge designs alongside top guides and rollers. Firstly, Caldwell manufacture twin knuckle hinge leafs for incorporating into roller and top guide designs. These hinges are extruded from aluminium and use stainless steel hinge pins for strength and durability. We also manufacture a second, D handle, type hinge. They are particularly suited to stack door sets, as the handle facilitates easy opening and closing. The handle is made from die cast zinc, which is combined with an aluminium extruded hinge.